New Delhi: Lalit Bhagia, 34, vice-president and head-digital (Internet and mobile) at Star India Pvt. Ltd, puts in 12-14 hours a day at work. Even though he’s employed with India’s leading entertainment broadcaster, he has little or no time to watch his favourite show Master Chef India. Back home, Bhagia’s tech-savvy wife, a finance professional, records her kitchen-sink dramas on Tata Sky’s high-definition digital video recorder (DVR) and watches them over the weekend. The couple is among the small but growing tribe of viewers of time-shift television, or watching programmes at their convenience, online or through a DVR, and not necessarily when they are being telecast. In a quiet revolution, Indians with high-speed Internet are simply going online to watch their favourite television shows. “Television consumption is undergoing a fascinating change. Suddenly, audiences have access to newer screens other than television," said Bhagia. “They dictate just when, where and how they want to watch their favourite shows. Appointment viewing is no longer necessary." The digital content developer knows what he’s talking—he integrates television content from a bouquet of Star channels with different online platforms. “In mature markets like the US, time-shift television is prompting people to bid adieu to cable connections," he said. Bhagia may be a digital industry expert, but there is no barrier to becoming a time-shifter. Trupti Roy, a 25-year-old public relations executive in Mumbai, has instructed her mother to record Bigg Boss for her. Roy got married four months ago and does not find time to watch the show at her in-laws’ home. However, she’s now trying to convince her husband to invest in a DVR. Bigg Boss is a reality show on Colors, the Hindi general entertainment channel of Viacom18 Media Pvt. Ltd. According to Digital Life, a recent study by TNS Global Market Research, a Kantar group company, of the total Internet users (100 million) in India, 18% are engaged in time-shift television as an activity. Simply put, these are people watching programmes online. By the end of 2012, this number will grow to 28%, it said. In terms of audience profile, 36% of time-shift television audiences were in the age group of 16-24, 20% in the 25-34 bracket, 18% in the 35-44 group, and 14% each in the 45-54 and 55-plus categories. “The consumption is at all levels," said Shailendra Gupta, assistant vice-president at TNS. Globally, time-shift television will emerge as one of the top three online activities in the next year. In India, however, broadband penetration needs to improve, according to TNS. Gupta expects the trend to gain pace in India in the next four-five years. Little surprise then that broadcasters and distribution companies are preparing to cater to an audience that will migrate from the television screen to watch shows elsewhere. Yahoo! India, for instance, has launched a premium online destination to offer television shows and breaking news, among other programmes. Tata Sky is currently testing its new service for high-definition DVR subscribers that will allow viewers to download the last five days’ programmes onto the digital set-top box. The system will likely use a broadband connection linked to the high-definition box for downloads, according to a subscriber who was approached for the service in Indirapuram near Delhi. A company official refused to share details as the service has not been formally launched. Time-shift television is a big category for YouTube in India since most households have only one television set, said Gaurav Bhaskar, spokesperson for Google India. “Today, six out of the top 10 videos watched on YouTube are television shows from different channels," said Gautam Anand, director (content partnerships) for Asia-Pacific at Google India. According to comScore Inc., a global Internet marketing research company, YouTube’s user base in India has grown from 16 million at the beginning of 2011 to 23.6 million now. Interestingly, the latest season of Kaun Banega Crorepati on Sony Entertainment Television (SET) got more than 3 million views from India alone. The episodes were uploaded within 10 hours of broadcast on YouTube. Ditto with Bigg Boss that has received more than a million hits on YouTube from India so far. Audience engagement with time-shift television prompted Sony to tie up with YouTube to offer content online, said Danish Khan, vice-president (marketing) at SET, owned by Multi Screen Media Pvt. Ltd.
“YouTube is a huge opportunity, an important platform for us," he said, declining to elaborate. “Although time-shift television won’t be a threat to prime-time television viewing, it’s a segment poised to grow." The official Bigg Boss website, which was created by an internal team at Colors, was visited by 2.5 million unique visitors who saw 17 million video views of this year’s show. The average time spent per user was 20 minutes. Bhagia describes time-shift television viewers as “lean-forward audiences", which will try out “content in newer screen sizes" as opposed to “lean-back" audiences, who will continue to watch shows on television. Digital experts like him claim broadcasters are investing ₹ 20-100 crore a year on digital offerings. Star, for instance, recently introduced iPhone applications for audiences to view their favourite shows. “Content from all our channels will be across all platforms. It’s our way of getting ready for time-shift television," Bhagia said. While broadcasters are gearing up for time-shift television viewing, there is as yet no way of measuring this migration. Although Nielsen’s television monitoring mechanism captures this data in the US and the UK, in India, TAM Media Research, the joint venture between Nielsen and WPP Group, says it’s too early to launch the service. 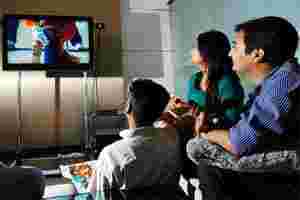 Recording devices in India have not even touched 1% of total television households, said L.V. Krishnan, chief executive officer of TAM Media, unlike the US, where 30% of television homes have a recorder. Secondly, prime-time appointment viewing is still strong in India, where homemakers constitute the bulk (85-95%) of the television audience. Also, Indian teleserials have no seasons. They run continuously, mostly for years, with several re-runs offering repeat opportunities. This is unlike the US, where episodes are generally not repeated and need to be recorded or watched elsewhere, Krishnan said. Another limiting factor is that broadband availability at home is still not widespread. An exception in this regard is sports, which has a strong online following, he said. Although Google’s Anand agrees that content consumption devices are changing, he cautions against calling “time-shift television" the next big trend in India. “It’s not a mass phenomenon despite 100 million users of the Internet in India," he said. Saurabh Tiwari, former programming head of Turner General Entertainment Networks India Pvt. Ltd’s Imagine TV, agrees: “Ditching ‘appointment viewing’ is still not the norm. Time-shift television will grow very gradually, not more than 2-5% every year. The growth will largely be in the metros to begin with," he said. Salil Kapoor, chief operating officer of Dish TV India Ltd, the Zee group’s DTH (direct-to-home) unit, also dismisses time-shift viewing options as a niche service. Dish TV has 8.5 million DTH subscribers and is yet to launch a recording device. Still, given that audiences like Bhagia and his wife, who watch amateur films from around the world at Vimeo.com on their Samsung SmartTV, and Roy, who recorded Splitsvilla on MTV while she was on a vacation, broadcasters and platform owners will need to account for viewers watching shows on laptops or smartphones rather than televisions.